Essaouira has it all! Ramparts and cannons looking out to sea, a maze of alley ways and souks selling artifacts, carpets and jewellry , the best handicrafts that Morocco has to offer, art galleries and museums ,excellent restaurants, riads and hotels to suit every budget a mysterious island with a deserted mosque and abandoned settlement, a thriving fishing port, a long beach with a collapsed fort. 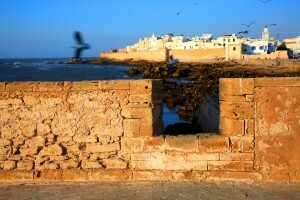 Essaouira is the perfect seaside destination for single travelers or family holidays. In the 18th century Sultan Mohammed III directed a French engineer, Théodore Cornut, and several other European architects and technicians to build the fortress and city blending Moorish and European designs of the period. There is a martello tower which was a revolutionay design at the time. Originally called “Souira” (“the small fortress”), the name became “Es-Saouira” (“the beautifully designed”) which is especially apt. The imposing gate to the harbour was built by an English renegade “Ahmed the English.” Thus the town has its own special magic and attracted the famous film director and actor Orson Welles who filmed his renowned version of Shakespeare’s Othello here in the early 1950’s using the ramparts and medina streets to great effect. Essaouira also had a hippy period when Jimi Hendrix and many others gathered here. The development of Essaouira into Morocco’s premier seaside destination owes a great deal to André Azoulay a native of the town and the Adviser to King Mohammed VI .Essaouira is now a cultural centre for the arts with a number of galleries featuring contemporary Moroccan artists and it is a great opportunity to view and buy their work which is becoming internationally famous. 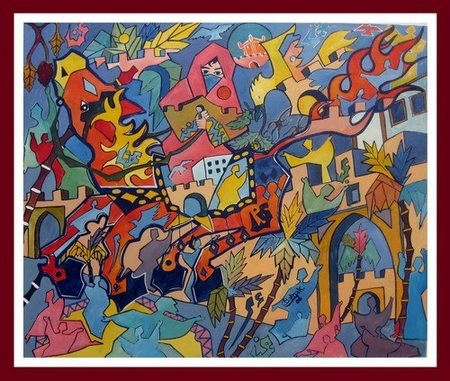 The Frederic Damgaard gallery is the best and oldest in town and features the work of local artists. Essaouira’s beautifully refurbished Sidi Mohammed Ben Abdallah Museum is in an old riad and has a small but interesting collection of jewellry, costumes, weapons, musical instruments and carpets fom the region. There’s a section explaining the signs and symbols used by local craftsmen and photographs of Essaouira at the turn of the century. Essaouira is famous for its wooden artifacts,bowls,intricately designed boxes and cabinets in workshops in the Skalla de Ville just under the ramparts. Other finds in the souks are carpets and kelims and jewellry shops near Avenue Istiqlal where you can find berber jewellry and items in gold. 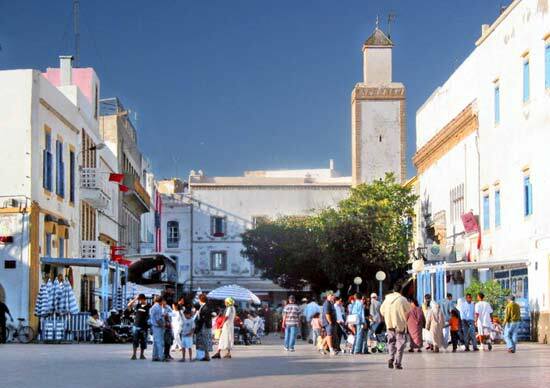 The magnificent square at the entrance to the souks has numerous cafés for breakfast and coffee during the day and patisseries bake excellent cakes and pastries which can be consumed in the cafés. Fishing with a fishing boat from the harbour can be arranged as can trips to the Ile de Mogador ( with a permit from the Port office) except during the mating season of the famous colony of the rare Eleanora’s falcons, between April and October. 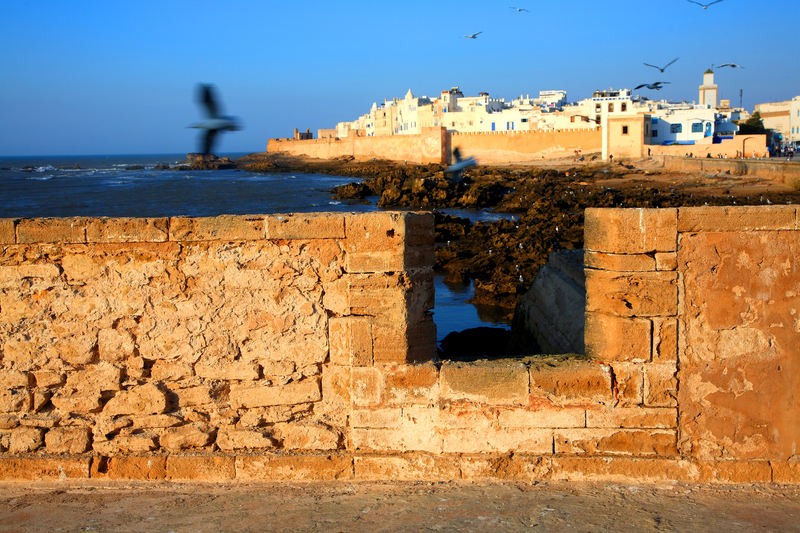 Essaouira is a windy town and thus a paradise for surfers, wind surfing is particularly popular and the bay is often filled with the colourful sails of windsurfers gliding back and forth with speed. Care should be taken by swimmers as there are strong undercurrents. If riding camels along the beach is not enough for you, you can ride horses and trek in the surrounding countryside and discover the ancient viaduct brought down by an earth quake. Outside the town you can witness the amusing sight of goat’s climbing argan trees to eat the berries and you can visit argan oil presses and women’s cooperatives producing argan oil which is now a highly sought after product for culinary and cosmetic purposes. Essaouira now has extremely good connections,with its own airport and a motorway linking it to Marrakech.The Supra tours bus company provides s regular service between Marrakech and Essaouira. There are three world class festivals held in Essaouira each year ; the Gnaoua Festival of World Music is held in Essaouira, normally in the last week of June. It is a great event and it is important to book hotel accommodation well in advance if you decide to visit at this time. The spring musical festival of Alizés in May features classical music and opera and the festival of Atlantic Andalusian music,art and dance in late September. Travel Exploration specializes in Morocco Travel.We provide Tours and travel opportunities to Morocco for the independent traveler and tailor-made tours for families and groups with a distinctly unique flavor. From Morocco’s Seven Imperial Cities, to the Magical Sahara Travel Exploration offers a captivating experience that will inspire you. At Travel Exploration we guarantee that you will discover the best of Morocco! Call Travel Exploration at 1 (800) 787-8806 or + 1 (212) 618882681 and let’s book a tour to Morocco for you today.